Fellow gun blogger Mike Vanderboegh gives us a link to Strategy Page on the various issues surrounding quality with SAPI plates. As I’ve said before, my own son was saved by a SAPI plate. I usually don’t like citing Strategy Page for anything. They don’t provide sources, and if it’s public domain (as it is from time to time), they don’t supply URLs. I also think that this particular Strategy Page article spends too much effort to explain something fairly simple. SAPI plates are for 5.56 mm rounds, while ESAPI plates are designed for 7.62 X 39. Troops generally train with SAPI plates, and get issued ESAPI plates in theater. But this little tease at the end of the article is worth some thought. Did you get that? Much of the production has moved to China. Ponder that statement for a moment. China is the land of counterfeit parts, and not just any counterfeit parts, but ones intended for our military. But there is another dirty little secret that most engineers know. The Far East (China, and to some extent Japan) doesn’t do QA. Engineers who have components fabricated in Japan must travel there extensively and repeatedly to ensure that they get what they’ve ordered. Then usually they still don’t. China is even worse. The concept of QA isn’t part of the cultural or social fabric of the country. They don’t understand it, don’t live it, don’t abide by its principles, and don’t have any conceptual understanding of it. Nuclear power plants are forbidden by federal orders from installing parts fabricated in China. Here is a note to my readers. Procure anything that must be reliable in America. Do not purchase guns, ammunition, tactical equipment, important products and supplies, body armor (soft or hard plate) or anything else from China. Don’t do it. Just say no. As for the ESAPI plates being made there, it’s just a little hypocritical to claim that our EPA is trying to protect the environment while in fact we just ship our “pollution” overseas. This isn’t the only product with which this kind of thing is done. Ah. Hypocrisy. Rather like the ATF claiming to enforce gun laws while shipping thousands of rifles and handguns into the hands of Mexican cartels, no? In Herschel Smith’s recent post, “What Defense Cuts Can and Can’t Accomplish,” he noted in response to President Obama’s announced cuts to Defense that such cuts were cover to make room for ruinous entitlements spending and ensured a future military that will not be prepared to meet America’s defense needs. No Federal function will ever be free of waste, fraud, abuse and mismanagement. Live with it. Conservatives must take it as almost axiomatic that the military, being part of the federal government, is inherently inefficient, wasteful, bass-ackwards, and prone to all the wrong priorities. Herschel’s post detailing the problems with various weapon systems is on point. That said, the U.S. military is, nonetheless, widely recognized the world over as the best-functioning part of the national government we have. It is, in many cases, the only thing that does, actually work even half the time. When any, significant natural disaster occurs anywhere on the planet and rapid response is required to prevent massive loss of life, who is the one doing the heavy lifting in terms of humanitarian relief? The U.S. military which has the advantage of being everywhere on the planet (or at least within carrier distance) and organized to deliver critical logistics in short order. For all its many, many faults, the U.S. military still gets the job done in far less time and in far better fashion than any, other alternative known to mankind at this point. Money will be wasted by the federal government just as a teenager will blow at least some part of that $20 bill you give them on a Big Mac and fries. There is simply no way around it. Yes, fraud/waste/abuse must be rooted out as far as possible and contracting must be improved blah blah blah, but there is no way this side of Paradise to put as many people in the field, all around the globe with as many types of weapons/units/vehicles et al without substantial waste. I am sick of Obama or any GOP candidate who puffs and preens about reducing waste at the Pentagon as if that is going to solve our national spending addiction. All of the waste and fraud at the Pentagon in a year is still a pittance compared to the entire, federal budget. The problem is in the very budgeting and spending process. Raging about government waste is performance art. Worse, when it comes to government and waste, the two are too often synonymous. Perhaps a better way of viewing Defense spending is to liken it to a huge pipeline. The U.S. government is like a huge pipe with lots of spigots and also a bunch of holes, leaks and cracks: water is going to leak out all over the place. Amazingly enough, however, due to the sheer volume and force, enough water will still manages to get through. Tightening down the spigot called the U.S. military does not save any, actual water. That water will just flow to other spigots like welfare, “green energy,” public employee unions, TSA harpies, bridges to nowhere and genius programs like “Fast and Furious.” To actually save water in this illustration, the entire plumbing system has to be re-engineered. Some Federal functions are more legitimate than others. Prioritizing is key. President Obama and the other Defense cutters act as if every federal undertaking is on an equal footing much as a family may decide to spend less on expensive orange juice and shift those dollars to cereal instead. For those of us who continue to believe that we live in a constitutional republic, however, the U.S. military in one of the very few legitimate functions that the federal government performs under the U.S. Constitution. Rather than starting the discussion about budget cuts with the one department that is actually in the U.S. Constitution, how about talking first about real, immediate cuts to the plethora of departments, agencies, programs and funding that are completely outside of any Constitutional mandate. Entitlements are the place to start, not the military. Like Obama, John Huntsman is particularly annoying in this regard. Worse yet, to hear Huntsman talk about Defense spending, the U.S. can treat it like putting off a leaky roof: we can put off needed spending for some period of time, hoping that the roof will not collapse, and someday get the repairs done. As Herschel’s post pointed out, this has been done with shocking frequency since the 1930’s and has always ended in disaster and tragic losses of life. As night follows day you can rest assured that a major violent international event will follow our budget cuts to defense. That’s not scaremongering, it is just history. Sure, we can try ramping up like we did all those other times, but history may be less forgiving this time around. Five s to times over the past 90 years—after the First and Second World Wars, Korea, Vietnam and most recently after the Cold War— the United States has slashed defense spending or disarmed outright in the mistaken belief that the nature of man or the behavior of nations had changed with the end of each of the wars, or that somehow we would not face threatour homeland or would not need to take a leadership role abroad. Time and again, policymakers have tended to neglect defense absent immediate, manifest threats to U.S. interests, and Americans and their military personnel have repeatedly paid the price of being less prepared. Common sense dictates that the Pentagon should take advantage of peacetime lulls to replace damaged or destroyed equipment, to modernize legacy systems, and to purchase next-generation replacements to avoid predictable shortfalls in future force structure. Yet most Administrations have failed to do so. The Heritage Foundation paper is well worth reading in its entirety and provides valuable citations and data that emphasize the follies of U.S. Defense spending practices for the past 90 years. The papers leads to the conclusion that the combat forces of the U.S. military are increasingly being hollowed out by decades of short-sighted cuts, binge spending and misallocations, with increasing shares of the budget going toward entitlement-like benefits and mushrooming bureaucracies. The United States is playing not only with fire but a can of gasoline nearby. Any one of a dozen international hot spots could ignite in the next years and the combat arms of the military are increasingly made to get by with aging equipment and insufficient numbers of soldiers and marines. In a bitterly comic twist, Democrats like Obama, who only 3 short years ago were complaining that President Bush was wearing out the U.S. military, are now cutting funds needed to re-build it. More shocking is that this defense-cutting contagion seems to have spread to conservatives. We seem to be watching our leaders flinging lighted matches at the gas can with little, apparent alarm. From North County Times, take a quick look at the new Major General who will be leading the Marines in Afghanistan. Mills, the son of a World War II Navy officer, rejects the implication of a frequently heard phrase about Afghanistan that says U.S. and NATO troops have the watches but the Taliban has the time —- meaning the enemy force can wait out the West and take over when foreign troops leave. The Marines he will command will conduct joint operations with Afghan National Army and security forces, and the troops will stay in the areas they are assigned and not live on fixed bases. That strategy is key in counter-insurgency operations, he said. “You can’t fight just from forward operating bases,” he said. The rules of engagement in Afghanistan are continuing to “mature,” Mills said, stressing that avoiding civilian casualties and proving to the population that U.S. forces can chase away and keep the Taliban from reasserting themselves is central to the mission. As his Blackberry buzzed with incoming e-mails every 30 seconds or so, Mills said he stays in shape by running and working out every couple of days. Folks, when you’re carrying a Blackberry which receives an e-mail every 30 seconds, you know that you’re micromanaging your reports. It’s a model taken from American Corporate conglomerates, and it isn’t appropriate for the U.S. military. It’s why General McChrystal feels that it’s appropriate to issue tactical directives that govern rules of engagement in very localized and unique situations, settings and situations about which he knows absolutely nothing. It’s the same mentality that dictates that a Battalion of Marines in Fallujah in 2007 must jettison their lighter, more dust and desert friendly Bates Tactical Boots (purchased at TAGs before deployment in lieu of the heavier clodhopper Marine Boots) because they don’t all look quite the same as the issue boots to a camera mounted in Fallujah streaming to the Pentagon. Or because of a MARADMIN on equipment. That’s right. Eight Hundred Marines throw away their boots with logistics having to ship that many more pairs to Fallujah because – they need to look the same as each other. Regardless of the alleged trust that field grade and flag officers have in what they call our fine young men in combat, the reality of the situation is that they don’t trust the enlisted men or the NCOs to do the right thing. If they did they wouldn’t need to deny artillery support for Marines in Kunar (killing four), take e-mails every 30 seconds, or in fact worry about tactics at all. Generals worry over strategy, not tactics. We have lost our way and become upside down in our focus, and unless we regain it, we – the premier Armed Forces in the world – we will lose our advantage to a bunch of ignorant, sandaled fanatics because we are being run by a group of control freaks who worry over the wrong things. Richard at Defence of the Realm is furious over British warriors perishing in Afghanistan, because they didn’t have to die. They were killed by an IED while aboard a Viking Amphibious Vehicle. I am sorry if it offends – and it certainly does upset some of the military types, and the “consultants” and designers responsible for the Viking and the decision to deploy it to Afghanistan – but, on the basis of all the evidence we have, Booker and I both have come to the conclusion that Lieutenant-Colonel Rupert Thorneloe and Trooper Joshua Hammond should not have died. That they did die is the greater offence and, while it must always be remembered that the proximate cause was a Taleban bomb, in a cold-blooded act of murder, the neglect of the MoD and all those involved with the deployment of this vehicle is a contributory factor. Thus does Booker in his column today point the finger squarely at the MoD. From Mick Smith (and others) in The Sunday Times, we get the first published confirmation of that which we had already worked out, that Lt-Col Thorneloe was riding in the front passenger seat of the Viking. With his driver, they were in two of the most vulnerable positions in a dangerously vulnerable vehicle. In other circumstances, writes Smith, Thorneloe would have travelled by helicopter; but it appears none was available. He notes, however, that the MoD declined to confirm or deny this. Without this facility, and wanting to “get up among his boys at the first possible opportunity,” Thorneloe found that, “A resupply convoy was going up there and he hitched a lift on that.” As the Viking approached a canal crossing, it passed over a hidden IED which destroyed the front cab. Thorneloe and the driver, Hammond, died instantly. The lack of helicopter notwithstanding, if Thorneloe had not been in the vehicle, someone else would have died. And the incident would already have been a footnote in the history of the campaign, blanked out by the operations being mounted, not least the big push by the US Marines further south. 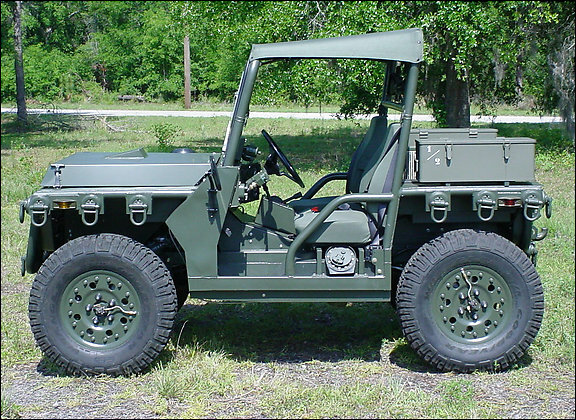 As for the Viking, this was originally produced as an amphibious assault vehicle and delivered to the Royal Marines in 2001, for use in the Arctic Circle as a mobility platform when reinforcing the Nato northern flank, assisting the Norwegians against a Soviet invasion. It was a Cold War machine, designed for a different purpose. In that role, the question of protection had been considered – and the machine was armoured against ballistic threats. However, within the “Littoral Manoeuvre” parameters set at the time, a decision was made deliberately to skimp on mine protection to save weight. This was to enable the machine to be lifted by a Chinook helicopter and to maintain the amphibious free board clearances. Richard goes on to point out that the Viking doesn’t have a V-hull like the more modern MRAPs fielded by the U.S. forces. Eric Rummel knows just how effective the V-hull can be at directing the force of the blast away from the vehicle. It took a matter of seconds to make 1st Sgt. Eric Rummel a true believer. The marine was driving through southern Afghanistan last year when his truck hit a roadside bomb buried in a gulch. The vehicle shuddered, popped into the air, and settled back down again in a cloud of desert dust. The whole thing was over before he knew what happened, but Sergeant Rummel and the two other men in the truck that day all walked away. The truck was a Mine Resistant, Ambush Protected truck (MRAP) – a 16-ton behemoth that came to be regarded as the soldier’s lifeboat in Iraq, its V-shaped hull saving lives by deflecting the blast of roadside bombs. Rummel’s story points to the same success in Afghanistan. “God bless the MRAP and what it does,” he says. But the mammoth trucks are built for Iraq, where troops are fighting a largely urban insurgency on city streets. Afghanistan’s insurgency is rural, and the Pentagon is in a race to completely redesign the MRAP for its new duty, making it lighter, with a beefier suspension and better off-road capabilities for troops who launch missions into fields and up hillsides – often with no roads. The effort, however, calls into question one of the bedrock tenets of Defense Secretary Robert Gates’s regime: He wants to prioritize equipment that saves troops’ lives. But experts wonder if, in the process, he is saddling the military for years to come with a fleet of vehicles that can be used in only one spot on the globe. “It’s not so clear that we can develop a new class of vehicles every time we go to a new country,” says Loren Thompson, chief operating officer of the Lexington Institute, a policy group in Washington. The initial program to come up with a new breed of Afghan-friendly MRAPs, called Multi-Purpose All Terrain Vehicles, or M-ATVs, will cost $2 billion. The MRAP program has produced more than 16,000 vehicles in two years. This month, the Pentagon is expected to finalize a contract that would put more than 2,000 M-ATVs in Afghanistan – some by this fall. The logic is clear: Roadside bomb attacks in Afghanistan are up some 80 percent over last year. 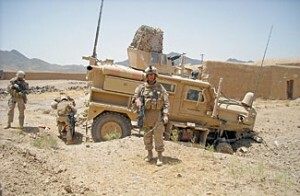 The day Rummel’s truck was hit, he was using his MRAP as an ambulance to evacuate war wounded near the town of Now Zad in Helmand Province in southern Afghanistan, an area of intense fighting. Before his truck had even arrived in the gulch, four other improvised explosive devices had detonated in that area; two marines later needed amputations. The explosion surprised Rummel, particularly because the Humvee in front of him had just driven through the same gulch unscathed. The Captain’s Journal hasn’t any wisdom to convey regarding whether the newer all terrain MRAP should go forward, or whether the existing MRAPs should be made to work. But either way, the use of amphibious vehicles in Afghanistan is about as stolid as I can imagine. At least the MRAPs have been relocated to Afghanistan, and more and better ones are on the way. Ultimately though, the best counterinsurgency is done on the ground. Dismounted patrols must be conducted in force, by more troops that we currently have (or have planned) in order to ensure an acceptable outcome. Infantry belongs on foot. tamiflu dosing Swine Flu And Symptoms intestinal flu? tamiflu for sale Comprar Tamiflu tamiflu and to relenza. swine flu italy At This Time What Is The Best Treatment For Swine Flu flu prevention signs! tamiflu stock Rumsfeld Tamiflu treatment of flu! Today is May 14, 2009. 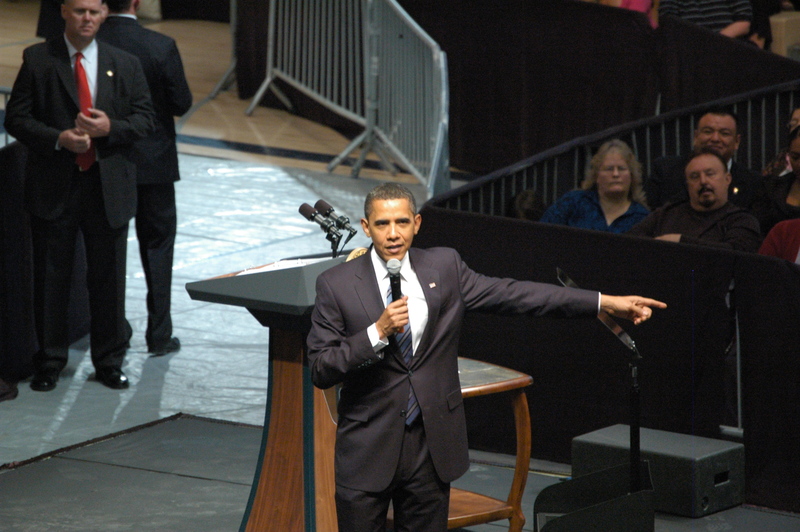 President Obama came to visit Rio Rancho, NM and hold a kind of “town hall meeting” of sorts. I did not vote for Mr. Obama, however, I felt compelled to go and be present at his visit. There was no way I could obtain a ticket so I contacted the Governor’s office and explained that my son is currently on his fifth deployment to the war zone and that we had lost our older son, eight years ago, who was a US Marine. In short order, I received two tickets to attend. I wanted to speak directly to the Governor and the President, but, that would not happen on this day. Maybe some day in the future it will, we’ll see. As for my take on the so called “town hall” meeting, I have some comments to make. Let me firstly say, Mr. Obama is all of our Commander in Chief, so, no matter what we think politically, left or right, Mr. Obama is the one who now controls my son’s destiny at war. My son has now served under three Presidents in his nine year career as an Army aviator. So I have a stake in what the current Commander in Chief has to say. But what did this new Commander in Chief have to say today here in New Mexico…? Observing the crowd, and listening to what was being said both verbally and non-verbally (body language), it seemed as though all I heard from the crowd was, “Mr. Obama, please pay off my credit card bills and please pay off my house mortgage. We’ve been too irresponsible to do it ourselves and you promised to give us all this free stuff….” That is what it sounded like to me. But I kept my mouth shut. I am always considerate of my surroundings, wherever I am at any given moment. In all fairness to Mr. Obama, he said one thing I agreed with. Credit cards are not free money. Duh……However, for some reason the people in the audience today, almost 3000 of them, seemed to think it is the governments’ job to pay their credit card bills. No wonder they think that, we’ve seen the current administration bail out big time bankers to the tune of trillions of dollars and rising, so, perhaps it is only fitting that the average dumbed-down New Mexican should think the same about their personal credit card debt…..What a country…! I find it really tough to be in the crowd of 3000 whiny New Mexicans complaining about how deep in debt they got themselves in while at the same time I have to worry about my son flying combat helicopter missions in Iraq, again, protecting the rights of these New Mexicans to ask for more free money from Mr. Obama. I remember back, exactly eight years ago to the day, when my other son, 2nd Lt. Jesse James Spiri, USMC was operated on for a serious medical situation and was told he would die and that his government would not spend one dime to help him. And he was a United States Marine Officer. I think there is something wrong with this picture. Now granted, this did not happen on Mr. Obama’s watch, but what is currently happening on Mr. Obama’s watch is this. Our nation is even the more so at war now in the middle east and my younger son is there again. And he would go another five times if called upon. He, like is father, is a true patriot. If the Commander in Chief says, “jump”, we both say “how high?”. “Mr. Obama, when you are finished paying off the credit card debts of all these irresponsible New Mexicans, and bailing out all those fat cats on Wall Street and their banker friends, will there be any money left to continue the maintaining of the CH47 helicopter fleet the Army is using whose funds you have scheduled to cut? My son has served his country on five deployments in the war zones of the middle east and there is talk that cuts in the Chinook helicopter community is imminent. You have asked my son to fight the country’s wars and he has done so valiantly, but now, you have his helicopters on the chopping blocks so these irresponsible New Mexicans who cannot seem to stay away from Wal-Mart and Best Buy, want you to take care of them, while they scream against those fighting for our freedom and safety…What’s up with that..?” I would ask. But, Mr. Obama did not call upon me. Maybe he knew who I was. Maybe he knew what I would ask. I’m not sure. But I know this, when he asks my son to go to war, as my son has just done, two weeks ago, I am forced to say, “Amen”, again. Today, I saw Mr. Obama and heard him speak. Many say how smart he is, how intellectual he is. I found him rather boring today. Oh, he knew a little about how to talk to a crowd, but, on this day, there was nothing really earth shattering that he said that struck a chord with me. He is still my Commander in Chief. I respect his position. But I am not impressed with his talk today. He didn’t say anything relevant to things I’m concerned about. Once before, my government told me there was not enough money to take care of my son, a Marine. Now, my government is telling me there is plenty of money to bail out bankers and New Mexicans that cannot pay their credit card bill from Wal Mart. But my government is not saying anything about taking care of the helicopters my younger son is flying in war to give these irresponsible New Mexicans the freedom to ask the current Commander in Chief for some money to pay their credit cards off. I’m not impressed. But I will still salute the current Commander in Chief and pray that my son will be safe in his helicopter while at war. The Obama administration has called for a 10% decrease in military spending to begin in fiscal year 2010. At The Captain’s Journal, calling this irresponsible would be an understatement, and less than our readers have come to expect. It’s just plain dangerous, considering the ongoing campaign in Afghanistan, Iraq being a likely protectorate of the U.S. for years to come, the resurgence of Russia flexing its muscle in Georgia and the Black Sea and Caspian regions, the growth of China and its naval forces, the need for growth of the size of both the Army and Marine Corps, and many other needs and dangers in the world as it now exists. Then along comes a report like the one on the Internally Transportable Vehicle. The idea for such a vehicle was developed in 1999 by the Marine Corps, which wanted a vehicle that could be carried in the V-22 Osprey aircraft to support assault operations and that would tow a 120 mm mortar and an ammunition trailer. Today, instead of one vehicle that could serve both functions, there are two — one for reconnaissance and a shorter version that tows the mortar and ammunition trailer — built by the same company. The first Growlers in the mortar program — officially called internally transportable vehicles, or ITVs — have been deployed to Marine units, but with limited combat capabilities. Because of their light armor and ammunition safety problems, “you can’t run it up the highway in an urban area such as Iraq,” said John Garner, the Marines’ program manager for the vehicle. “But it could accompany foot-mobile Marine infantry in a not-built-up area such as Afghanistan,” he added. … after the contract was awarded, Garner said, “there were significant additions made for capability.” For example, an air suspension had to be added to allow the Growler to get on and off the Osprey because it could raise and lower its height. The makers added a new cooling system, power steering and power brakes, along with a beefed-up General Motors engine similar to the one used in the GMC Yukon. Altogether, Garner said, about $50,000 of the cost growth was in additional off-the-shelf items that now permit the Growler to travel up to 45 mph on a highway. To be fair, this concept wasn’t created out of nothing. It goes hand in hand with the Osprey V-22, Amphibious Assault Docks and the expeditionary force structure that the Marines seek. Also to be fair to the Marines, the Army has some on order as well. But it’s time for some straight talk. Here is how it happens. Performance specifications are written. Request for quotes are sent out to potential contractors, and bids are received and evaluated. They are evaluated based on cost, which ones most closely adhere to the performance specifications, and so forth. A contract is awarded, and rather than simply adapting the forces to the contract, the practice is to adapt the contract to every request for a modification. It is the last part that adds cost, and the first part that causes price to be so high to begin with. For the price of the Growler one could go down to the local auto dealership and order up eight to ten jeeps. Doing so would require that unit-based enlisted men figure out a way to load them onto the V-22s with ramps, jacks, winches, or other means. But in fact it is that simple. We must learn to make do with less, even if the defense budget is not cut. We must learn to husband our resources so that they will go further, arming the U.S. military to remain the best and best-equipped in the world. If this requires the use of duct tape, cable ties, winches, hoists, bungee cords, jacks and chain falls, then so be it. When we spend this much money on a vehicle, something else goes wanting, such as badly needed lighter body armor, open bolt designs for SAWs, and so on. We simply cannot spend $200,000 on a 4WD vehicle and continue to be the best armed military in the world. The program manager should be aghast as the cost of the vehicles, and should never have let it enter the production phase. It’s not a matter of funding the military. It’s a matter of putting the funding in the right place and husbanding our resources. Every family member on a budget does this every day, and it isn’t unreasonable to expect that military equipment design programs do it too. On January 29 we learned that the Army was issuing a recall of more than 16,000 sets of ESAPI (or enhanced side arms protective inserts) that had been issued to its soldiers. By way of description, the SAPIs are ceramic plates that are designed for stopping 7.62 mm rounds, while the soft panel armor (with more coverage, but less weight) is designed for protection against 9 mm rounds and shrapnel. 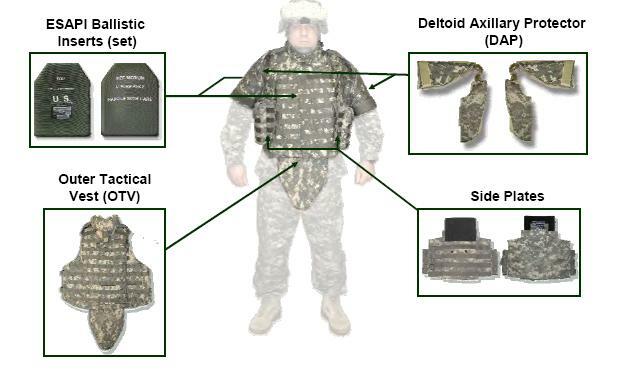 The plates and soft panels are fundamentally the same for both Army and Marine body armor, but the carrier vests are slightly different. … testing facility officials did not consistently follow the test plan or COPD requirements for the fair shot determination, measurement of BFD, or plate size, and that the PEO Soldier scoring official could not provide adequate documentation that explained why certain plates were selected for scoring and others were disregarded during the scoring process. We were also concerned that the contracting officer technical representative (COTR) made an unauthorized change to Contract 0040 by instructing the testing facility officials to deviate from the COPD and use an offset correction technique (a mathematical formula used to adjust the BFD). The PEO Soldier COTR communicated this change by e-mail to the testing facility without approval from the contracting officer. The Army has understandably defended their program, and it should also be pointed out that contrary to published reports, the Inspector General’s office didn’t offer any conclusions about the safety of particular lots of SAPI plates currently in theater. But as long as government organizations are battling with each other over government requests to investigate each other, and as long as independent engineering consultative services are not procured, whatever solution that floats to the top will be less than satisfying, and probably less than ideal. One final point is in order. This nugget of gold is contained in the report. “The Army purchased 51,334 sets of ESAPI for $57,107,890.00.” This is just over $1100 to outfit each Soldier with hard plate body armor. All testing and design is probabilistic, with sample size being limited for the so-called “zero percent chance of penetration” test and with other design criteria based on equal probability of penetration and non-penetration. It is the way of things. Performance is not digital; it isn’t as if safety can be guaranteed in any particular circumstance. Again, science and engineering is in many ways a probabilistic endeavor. But this is a minimal cost to provide minimal protection for our warriors. If the truth is told, even in a time of budget difficulties, there is absolutely no reason that protection cannot be increased and weight decreased (we have observed before that the only way to significantly decrease the total weight of body armor is to decrease the ESAPI plate weight). It’s merely a matter of commitment. What is a Warrior’s Life Worth? Before The Captain’s Journal is a strategy blog, we are first and foremost a logistics and tactical blog (logistics and tactics, techniques and procedures – TTP – is our first interest). We are also a Marine blog, and so naturally, when McClatchy published their article (U.S. Marines find Iraq Tactics don’t work in Afghanistan), we were interested. Several money quotes are given below, followed by commentary and analysis. DELARAM, Afghanistan — On a sunset patrol here in late December, U.S. Marines spotted a Taliban unit trying to steal Afghan police vehicles at a checkpoint. In a flash, the Marines turned to pursue, driving off the main road and toward the gunfire coming from the mountain a half mile away. But their six-ton vehicles were no match for the Taliban pickups. The mine-resistant vehicles and heavily armored Humvees bucked and swerved as drivers tried to maneuver them across fields that the Taliban vehicles raced across. The Afghan police trailed behind in unarmored pick-up trucks, impatient about their allies’ weighty pace. The Marines, weighted down with 60 pounds of body armor each, struggled to climb up Saradaka Mountain. Once at the top, it was clear to everyone that the Taliban would get away. Second Lt. Phil Gilreath, 23, of Kingwood, La., called off the mission. “It would be a ghost chase, and we would run the risk of the vehicles breaking down again,” Gilreath said. The Marines spent the next hour trying to find their way back to the paved road. Their MRAP mine-resistant vehicles, which cost $1 million each, were specially developed to combat the terrible effects of roadside bombs, the single biggest killer of Americans in Iraq. But Iraq is a country of highways and paved roads, and the heavily armored vehicles are cumbersome on Afghanistan’s unpaved roads and rough terrain where roadside bombs are much less of a threat. Body armor is critical to warding off snipers in Iraq, where Sunni Muslim insurgents once made video of American soldiers falling to well-placed sniper shots a staple of recruiting efforts. But the added weight makes Marines awkward and slow when they have to dismount to chase after Taliban gunmen in Afghanistan’s rough terrain. Even the Humvees, finally carrying heavy armor after years of complaints that they did little to mitigate the impact of roadside explosives in Iraq, are proving a liability. Marines say the heavy armor added for protection in Iraq is too rough on the vehicles’ transmissions in Afghanistan’s much hillier terrain, and the vehicles frequently break down — so often in fact that before every patrol Marine units here designate one Humvee as the tow vehicle. In Iraq, American forces could win over remote farmlands by swaying urban centers. In Afghanistan, there’s little connection between the farmlands and the mudhut villages that pass for towns. In Iraq, armored vehicles could travel on both the roads and the desert. Here, the paved roads are mostly for outsiders – travelers, truckers and foreign troops; to reach the populace, American forces must find unmapped caravan routes that run through treacherous terrain, routes not designed for their modern military vehicles. U.S. military leaders recognize that they need to make adjustments. During a Christmas Eve visit here, Marine Commandant Gen. James T. Conway told the troops that the Defense Department is studying how to reconfigure the bottom of its MRAPs to handle Afghanistan’s rougher terrain. And Col. Duffy White, the commander of the Special Purpose Marine Air-Ground Task Force, said he anticipates that Marines will be wearing less armor by spring, when fighting season begins again. As regular readers know from our body armor coverage and analysis, we have been preaching the virtues of weight reduction in body armor for months, and even years (focusing on the weight of SAPI plates). Further, the Marine Corps was lethargic to react to known problems with troop transport, abandoning an urgent request for MRAPs in 2005. 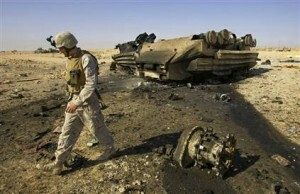 The Marines had chosen to run Amphibious Assault Vehicles across desert terrain, and one particularly brutal example of the consequences of this choice was the loss of fourteen Marines near Haditha in August 2005. Marine Commandant Conway has lamented the heaviness of the force now, and if there is a need for lighter, faster-moving all-terrain vehicles, then the Corps cannot be as slow to react as it was in Anbar. We have also commented that some TTPs (such as satellite patrols) won’t have the same value in the rural terrain of Afghanistan versus the urban terrain of Iraq. Having said that, the lectures of the Marines will stop and the analysis will start. First of all, the Marines do not carry “60 pounds of body armor each.” Someone has misled the journalist, or the journalist has simply gotten the wrong data, and unfortunately the misinformation has made it’s way into print. 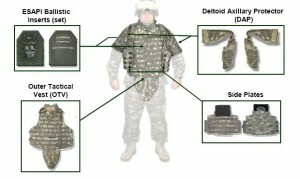 The Modular Tactical Vest, the outer tactical vest in lieu of what the Army uses (Interceptor Body Armor vest) carries the same front, rear and side SAPI plates as the Army, and although the Marine MTV consists of slightly more soft panel protection than the IBA which adds a couple of pounds, the weight of all body armor fielded for the Army and Marines equals roughly 32 pounds, give or take a few ounces. The balance of the weight to which the journalist refers is a hydration system, ammunition, weapon (which is hooked to the vest by a carabiner) and other odds and ends (e.g., ballistic glasses, gloves, tools, etc.). These things would be carried by the Marine whether there was body armor or not. So roughly half of the weight is non-negotiable. Further, a backpack adds much more weight to the system. Second, the McClatchy reporter says the following: “The Afghan police trailed behind in unarmored pick-up trucks, impatient about their allies’ weighty pace,” as if the U.S. Marines were holding up the Afghan police. This is embarrassing for McClatchy, even if they aren’t embarrassed. The notion of the Afghan police being anything but rife with corruption is absurd, and there was a reason that the police didn’t go out ahead of the Marines. It’s the same reason that of the nine dead and twenty seven wounded in the Battle of Wanat, not a single one was Afghan Army. They were all U.S. Army. There wasn’t a chance in hell that the police would have gone it alone without the Marines, and they likely wouldn’t have even contributed to the fight. Third, this example shows the need to adapt, and adapt the Marines will. But Marines who have to chase the Taliban through the hills need more Marines. Counterinsurgency will require more force projection, this being done in the rural rather than urban areas (the McClatchy article does have this right). Intelligence-driven raids and kinetic operations will ensue upon adequate contact with the population, with the Marines providing them the security they need from the Taliban. The real fight will start when the Marines are waiting for the Taliban in their mountain lairs because of what the people have told them. Or, when the Taliban can’t come out of their caves because the Marines own the terrain. Dismounted patrols will suffice just fine with enough Marines, and the question of all-terrain vehicles won’t be such a weighty issue. 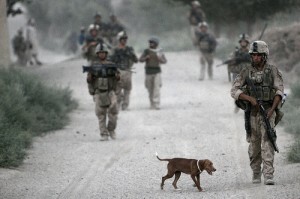 Corporal William Ash, a squad leader from 1st Platoon, Bravo Company, Battalion Landing Team 1st Battalion, 6th Marine Regiment, 24th Marine Expeditionary Unit, NATO International Security Assistance Force (ISAF), along with a stray dog lead a patrol through a city in Helmand Province, Afghanistan. When the platoon moved into the area, they found two stray dogs, and each time the Marines head out on patrol the dogs are right at the Marines’ side. The Marines will ramp up force projection in Afghanistan, and McClatchy reports like the one above won’t take on the importance they do with minimal forces. The Marines will adapt, improvise and overcome. McClatchy, on the other hand, should do a much better job of understanding Tactics, Techniques and Procedures. And in order to have any respectability whatsoever, they need to get the data right concerning simple things like body armor weight. With the road infrastructure and the relatively stable terrain in Iraq, MRAPS have been a huge success in protection against IEDs. They do have their difficulties with low hanging power lines and therefore some limitations in highly urban settings, but this is area in which dismounted patrols must be used anyway to contact the population. But with the undulations in the terrain in Afghanistan, as reported in June, the MRAPs are having some problems due to their high center of gravity. Three Green Berets drowned Saturday when their Mine-Resistant Ambush-Protected vehicle rolled into a river in Afghanistan. The deaths come amid growing concerns about the threat of catastrophic rollovers in the military’s silver bullet solution to improvised explosive devices. Two military reports issued in June indicate growing problems associated with the MRAPs’ potential for rollover — as well as electrocution, when the vehicle snags low-hanging power lines — and an emerging threat from the vehicle’s glass dissolving into a cancer-causing powder when struck with explosively formed projectiles. Saturday’s accident occurred in volatile Kandahar province and killed three members of Company A, 1st Battalion, 7th Special Forces Group, based at Fort Bragg, N.C., according to a Defense Department statement. Anticipating a more active role on Afghanistan, the Marine Corps is busy investigating alternative solutions. With plans to redeploy more Marines to Afghanistan later this fall, companies like General Dynamics Corp. and Force Protection Inc. are being asked to re-engineer mine-resistant vehicles that can traverse the war-ravaged country’s mountainous terrain while offering even greater protection. High altitudes, dispersed battalions and restricted travel zones are among the serious challenges facing the service as it weighs the resources needed to perform its missions in Afghanistan where violence has escalated, senior Marine Corps officials told defense industry executives at the service’s annual expo Thursday. Senior Marine Corps officials are concerned the current MRAPS are ill-equipped to handle the rocky terrain in Afghanistan, and are too heavy to easily transport to areas where they are needed. Blasts from roadside bombs are the leading cause of combat deaths and injuries in Iraq and have become a growing threat in Afghanistan, but it’s unclear whether the Marine Corps will buy more of the same vehicles, said Dillon. Currently, there are more than 900 MRAPs in Afghanistan, and close to 8,000 in Iraq. To date, the Pentagon has spent $22.4 billion on the program. Instead, the service hopes to approve a hybrid armored vehicle that would provide the same type of protection as an MRAP, but would be more agile and provide improved maneuverability, Marine Corps officials said. It’s more than just rollover concerns that are driving this innovation. It is maneuverability, off road terrain capabilities and transportability. The Marines may not be pursuing the hottest next-gen warrior trappings such as the exoskeleton, but when it comes to realistic battle space needs and possibilities, they have always been on top of their game. Let’s hope that this program is off to a good and quick start. Perhaps some representative of General Dynamics can contact The Captain’s Journal to give an update on the progress and goals.